A green and sunny Beijing welcomed the EMBA students from HEG Fribourg School of Management on April 11th for their China Study Week 2016, organized by the Science, Technology and Education Section of the Embassy and swissnex China. 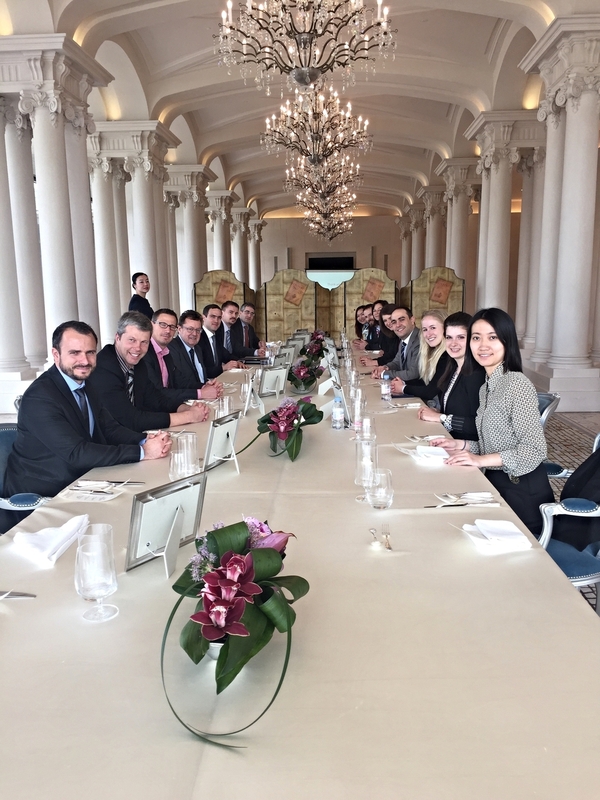 After a warm welcome and introduction by the Section and Mr. Rolf Studer, General Manager of Swisscham, the students were received by H.E Ambassador de Dardel, who gave the word to Mr. David Braun and Mr. Fabian Heller, Head and Deputy Head of the Economic Section for a Q&A on the Sino-Swiss economic relation. The topic of the study week was ‘Doing Business in China with a Focus on Intellectual Property Rights’ (IPR)”, an interesting and current issue in Chinese politics and society, which was introduced to the delegation with lectures held by Prof. WANG Rui from Beijing University and Prof. Wu Weiguang from Tsinghua University. For a deeper understanding, the students also attended a session at University of International Business and Economics (UIBE) with Prof. LIU Baocheng, who critically assessed the issue and gave an insightful lecture on IPR. The academic part of the study week was complemented by a more technical part which consisted of several company visits. At Lee & Lee Associates, a professional accounting and business consulting firm, the EMBA delegation learned about doing business in China and how foreign companies can enter the Chinese market. Moreover, China’s innovation and high-tech competences were impressively displayed at the Huawei R&D center. The second largest telecommunications equipment company in the world by revenue, who delivers a broad portfolio of innovative ICT solutions, showed their newest products and informed about their ongoing collaborations with Swisscom, the leading Swiss telecommunication company, on 5G and railway communications technology. Finally, the delegation experienced how LEM Electronics, a Swiss company and market leader in providing innovative and high quality solutions for measuring electrical parameters, successfully expanded to China. During an open discussion with the company management, the students learned how LEM manages their IPR and they were even invited to visit the production site where the current and voltage transducers are produced. Of course, in order to really experience Beijing, the students also tasted its food and delicious flavors. From Beijing roast duck to colorful dumplings to the tasty Yunnan food and regional specialties from the Mutianyu Great Wall area, everything was happily indulged. Finally the students enjoyed a day off hiking on the Great Wall and wandering through Beijing’s hutongs – a great cultural end to an intensive study week, which ended a week later in Shanghai. In this sense: Merci beaucoup, au revoir et a une prochaine, Fribourg EMBA !